Clydebank FC can today announce former Stirling Albion captain Ross Forsyth as our second summer signing. Progressing from a player to captain, U20 coach and finally assistant manager, Ross made more than 300 appearances for the Binos across two spells with the club, and is to be awarded with a testimonial. The 34 year old defender, who is also a UEFA A licensed coach, joins on a one year deal. He said: “Working with the Kieran and Marc was a big attraction in coming to Clydebank F.C. I had a few offers to stay in the senior game but after 19 years and over 500 appearances, I was looking for something different and the opportunity to work with them both really appealed to me. I know them both well and I know the passion, knowledge and enthusiasm they have for the game. In a short space of time they have done well in achieving promotion and I am here to help continue that progress. 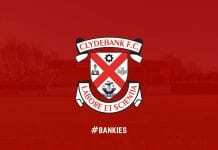 Welcome to the Bankies, Ross.